Berry Salad with Creamy Strawberry Poppy Seed Dressing bursting with fresh berries and adorned with CANDIED pistachios and feta is so easy, delicious and beautiful for company! 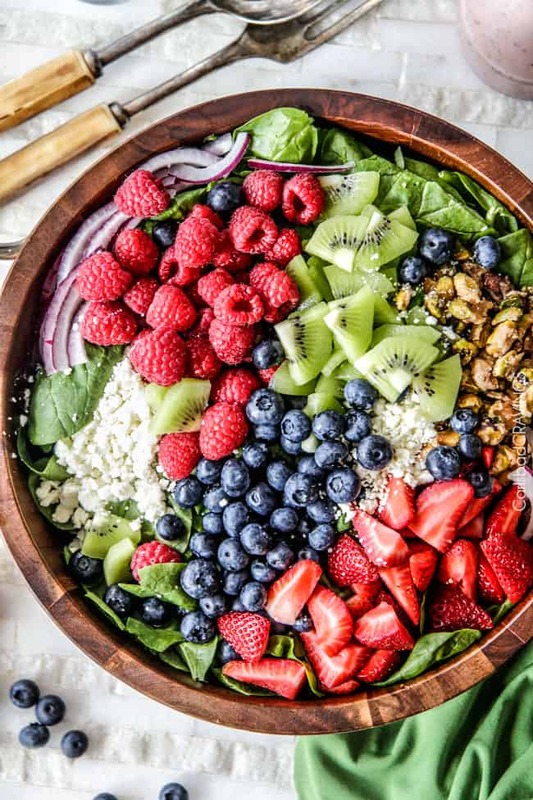 This Berry Salad is summer in a bowl. 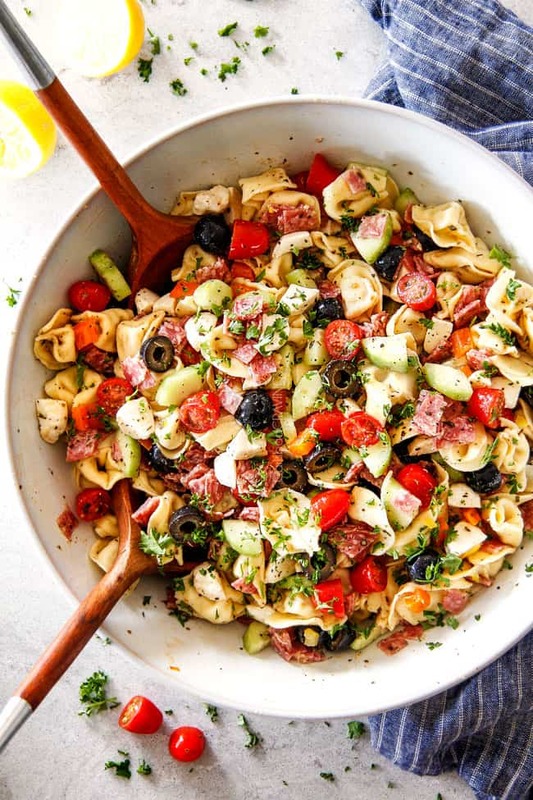 It’s bright and refreshing, requires hardly any chopping and all the ingredients can be prepped ahead of time for an easy, stress-free potluck salad side. You can customize the Berry Salad with your favorite ingredients or whatever you have in your garden! 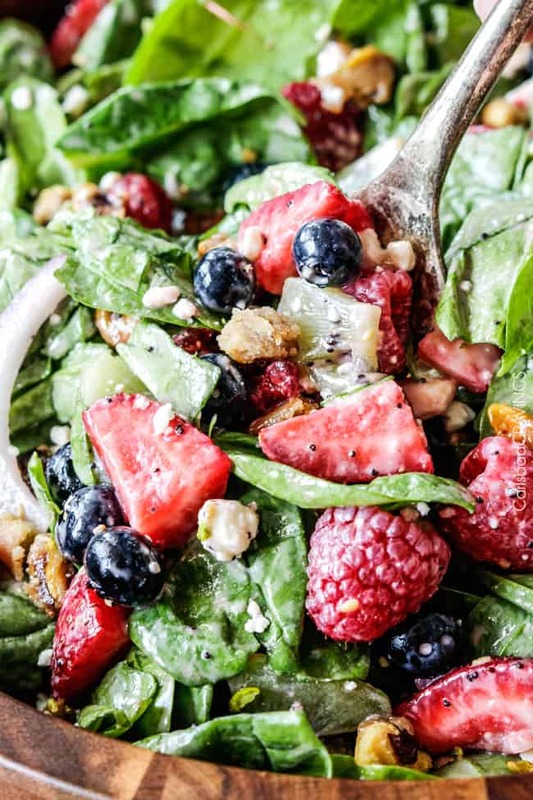 This isn’t just any Berry Salad, this Berry Salad recipe is is loaded with candied pistachios, creamy feta and a silky Strawberry Poppy Seed Dressing! Because in my opinion, every salad needs cheese and nuts and the best dressing in order to be extraordinary. And we only aim for extraordinary here at Carlsbad Cravings. 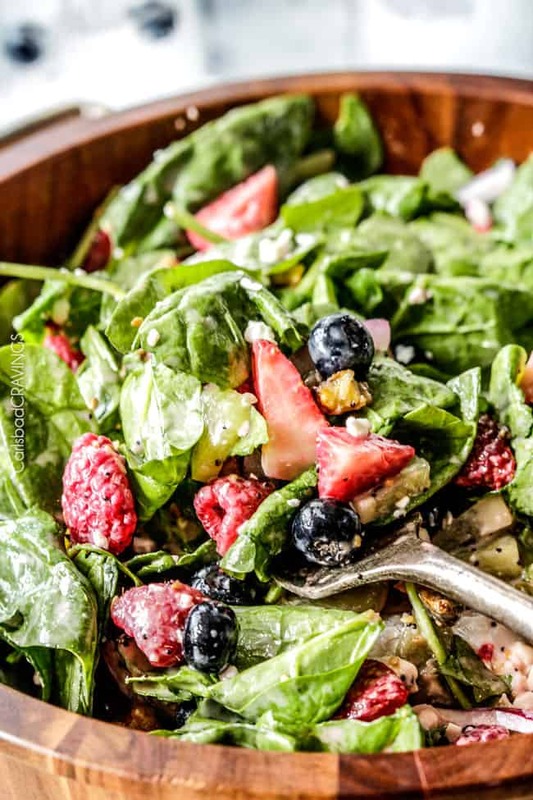 The salted, roasted, candied pistachios and the creamy, salty feta are the crowning jewels in the Berry Salad that perfectly balance the the sweet enveloping Creamy Strawberry Poppy Seed Dressing. I use my 5 Minute Caramelized Nuts Recipe for the caramelized pistachios- so – you guessed it – they only take 5 minutes and are so worth it. You can substitute the pistachios for caramelized almonds or walnuts as well. If you are running short on time, you can skip the caramelizing of the nuts altogether and just use plain nuts but you will also be skipping out on some serious YUM. You can also prep the nuts days in advance so you can have them all ready to go and are never tempted to skip this crowning jewel. 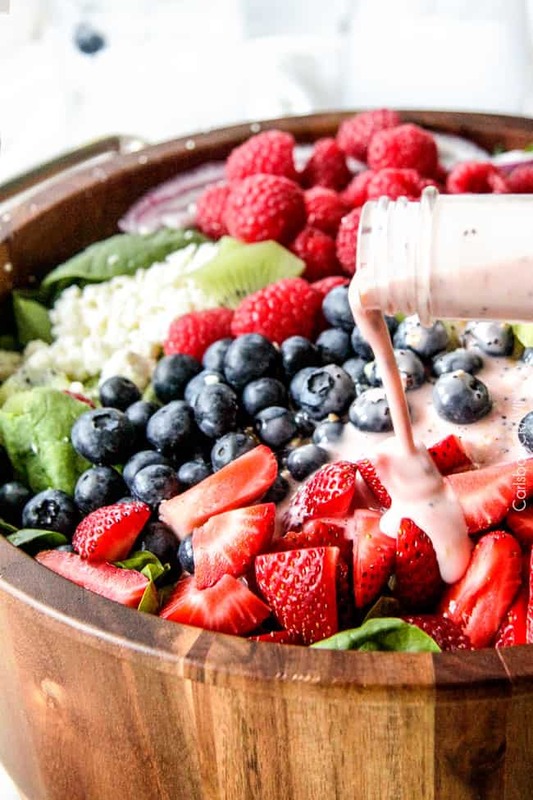 If a salad is only as good as its dressing – then this Berry Salad is deeeevine. This Strawberry Poppy Seed Dressing is deceptively simple, velvety, smooth, and sweet speckled with poppy seeds and sesame seeds. It starts with a base of strawberry yogurt which you blend with sour cream and mayo, cider vinegar, sugar, dried onions, poppy seeds and sesame seeds. You can customize the dressing to make it tangier by adding more vinegar, or sweeter by adding more sugar. You can prep the dressing day sin advance and store in an airtight container until you’re ready to dress your salad. 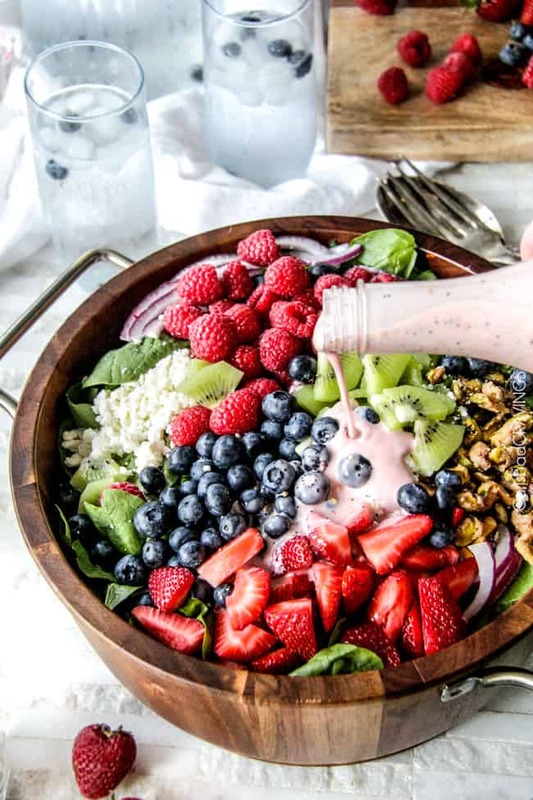 Refreshing Berry Salad with Creamy Strawberry Poppy Seed Dressing so you can taste the best of summer in every forkful. Looking for more Summer Salad Recipes? 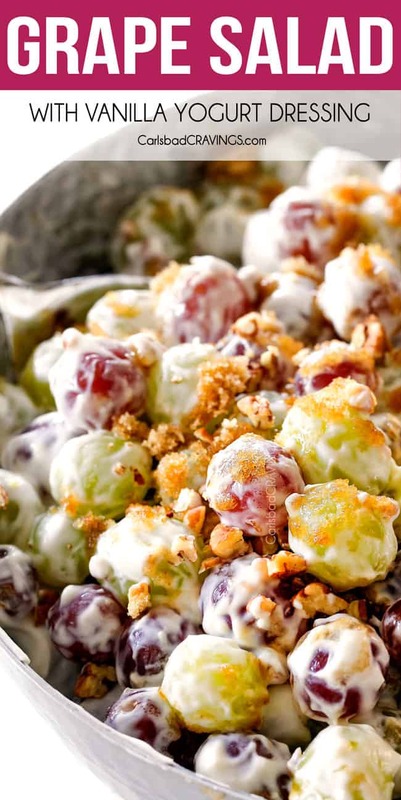 Want to try this Berry Salad Recipe? 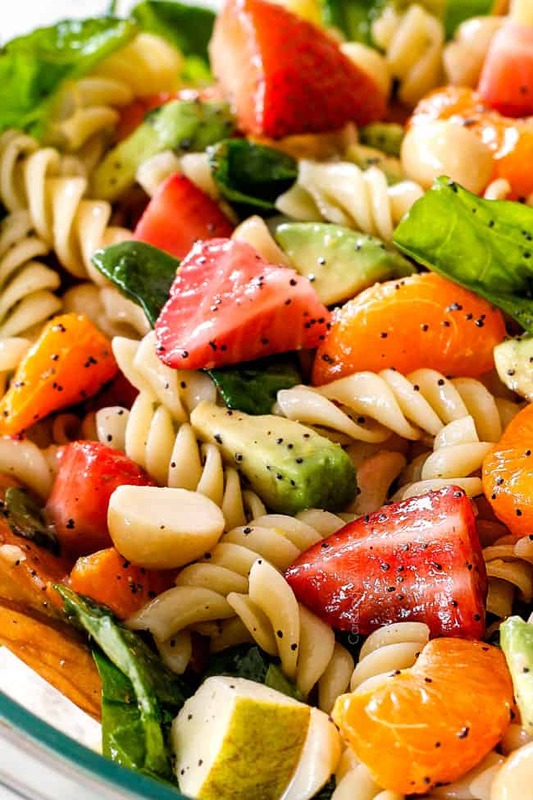 Pin it to your SUMMER, SALAD or SIDES Board to SAVE for later! 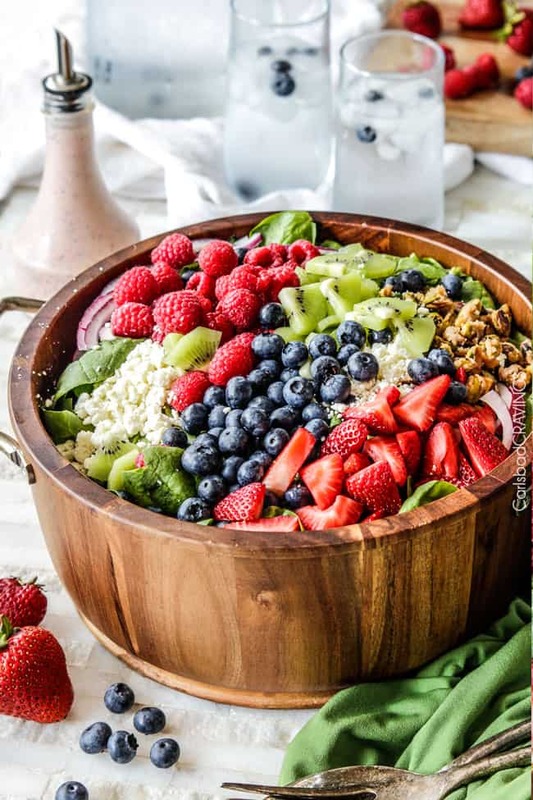 Berry Salad with Creamy Strawberry Poppy Seed Dressing bursting with fresh berries and adorned with CANDIED pistachios and feta is so easy, delicious and beautiful for company, it is sure to become a new favorite! You and Nagi are making me blush! 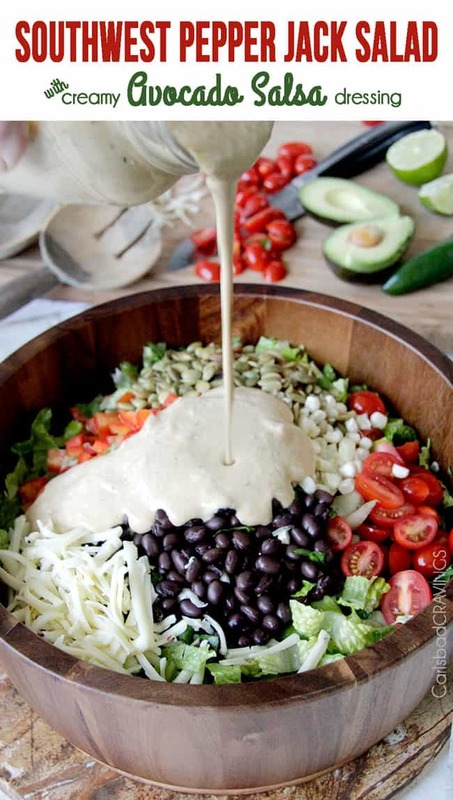 I love all the ingredients in this salad too – and you will LOVE the creamy dressing! Thanks for your comments Dorothy, I love them all! How many servings is the berry feta spinach salad? Hello! It should serve about 6 people. Enjoy! Is there something I can substitute for the spinach? Hi Angie! You can substitute any of your favorite greens – mixed greens, romaine, etc. Enjoy! Is the strawberry dressing located somewhere else? I have searched and searched with no luck, and really want to give this a try! Hi Anne, I recently switched to a different recipe plug in and apparently some of my recipes disappeared – AH! I am so sorry! It should all be there now. Thank you for your patience! We just had this on Easter and it was so good. My mom is going to make it again this weekend for a dinner with friends. Thanks! YAY! so happy you love this salad Jennifer and what a great salad to serve friends! I just made a FB video of it last week so it was fun to eat it again – its been a while for me 🙂 Thanks for taking the time to comment! I made this last night and it was delicious!! I only wish I would have seen it to make for Easter! I passed it onto my sisters too! So good!! Awesome Kelly, I’m so happy you loved it thank you! Next Easter!!! Can you make any of this the night before? Jw how well it keeps in the fridge! Hi Kendra! You can certainly make this salad the night before and keep the components separate and then assemble when ready to serve. Enjoy! Hello, can you suggest what I would substitute for the nuts as my son is allergic? Hi Andrea, sunflower seeds would be delicious!